The Chinese list included aircraft up to 45 tons in weight, excluding high-end Boeing jetliners such as the 747 and 777, leaving Beijing high-profile targets for possible future conflicts. WASHINGTON (AP) — An escalating trade dispute between the world’s two biggest economies heightened fears Wednesday of a global trade war, sent global stock markets tumbling but also left the door open to a negotiated settlement that might prevent any serious damage before it begins. The Dow Jones industrial average tumbled after markets fell in Europe and Asia on worries of an intensifying trade conflict between the United States and China. 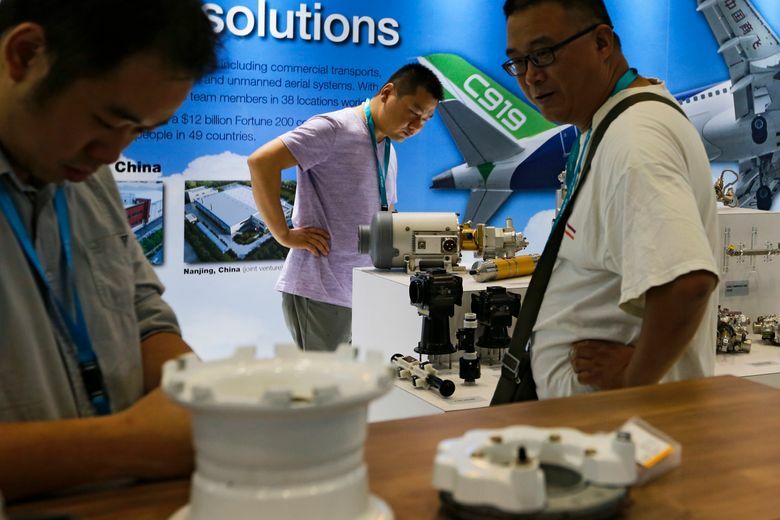 After the United States unveiled plans to impose tariffs on $50 billion in Chinese imports Tuesday, China lashed back within hours, matching the American tariffs with plans to tax $50 billion of U.S. products, including soybeans and small aircraft. The tariffs wouldn’t kick in right away. The U.S. government is inviting public comment on its trade sanctions through May 11 and will hold a hearing on the plan May 15. And China set no date for its 25 percent duties to take effect, saying it is waiting to see what President Donald Trump does. U.S. Commerce Secretary Wilbur Ross brushed off concern about a trade war. In an interview with CNBC on Wednesday morning, Ross said the tariffs announced by China amount to a mere 0.3 percent of America’s gross domestic product. He added that some U.S. punitive action against Beijing has been “coming for a while” over what the United States calls China’s predatory behavior involving technology. “What we’re talking about on both sides is a fraction of 1 percent of both economies,” Ross said. The larger concern, the commerce secretary said, is the protection of U.S. intellectual property. The clash reflects the tension between Trump’s promises to narrow a U.S. trade deficit with China that stood at $375.2 billion in goods last year and the ruling Communist Party’s development ambitions. 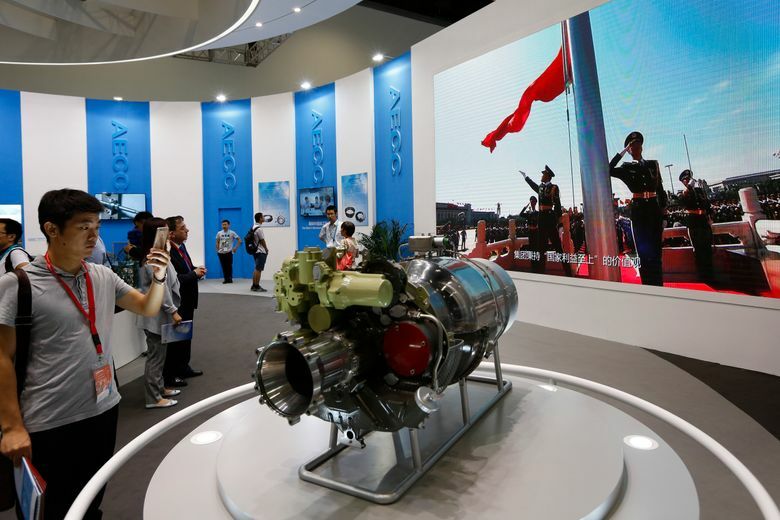 Regulators use access to China’s vast market as leverage to press foreign automakers and other companies to help create or improve industries and technology. China said it would immediately challenge the U.S. move in the World Trade Organization. A deputy finance minister, Zhu Guangyao, appealed to Washington to “work in a constructive manner” and avoid hurting both countries but warned against expecting Beijing to back down. Companies and economists have expressed concern that global economic activity might sputter if other governments are prompted to raise their own import barriers. China announced tariffs worth $50 billion on a series of U.S. products including soybeans, whiskey and cars. Chinese officials said they were obliged to act after the U.S. announced plans for tariffs in an escalating dispute over China’s technology program and other trade issues. American companies have long chafed under Chinese regulations that require them to operate through local partners and share technology with potential competitors in exchange for market access. Business groups say companies feel unwelcome in China’s state-dominated economy and are being squeezed out of promising industries. Chinese policies “coerce American companies into transferring their technology” to Chinese enterprises, said a statement by the U.S. Trade Representative. Foreign companies are increasingly alarmed by initiatives such as Beijing’s long-range industry development plan, dubbed “Made in China 2025.” It calls for creating global leaders in electric cars, robots and other fields. Companies complain that might block access to those industries. Wang, the commerce official, defended “Made in China 2025.” He said it was “transparent, open and non-discriminatory” and foreign companies could participate. Wang said the plan, which sets targets for domestic brands’ share of some markets, should be seen as a guide rather than mandatory. A report released Tuesday by the U.S. Trade Representative also cited complaints that Beijing uses cyber spying to steal foreign business secrets. The Global Times newspaper, published by the ruling party and known for its nationalistic tone, suggested that further retaliatory action might target service industries in which the United States runs a trade surplus. Regulators have wide discretion to withhold licenses or take other action to disrupt logistics and other service businesses. AP Writers Zeke Miller, Gillian Wong and Christopher Bodeen and AP researchers Shanshan Wang and Yu Bing contributed.